First you need to decide, what are you going to use the amplifier for, how loud should it be, etc.. Cheapest of the guitar amps, are coming with a maximum of 10 watts of power. Their main asset is portability; they can also usually work with batteries for up to 15-20 hours on their maximum output. Their sounds are usually good enough for practicing at home or on the go as well, but due to their sizes, rich bass sound cannot be achieved. Mostly combo or solid state units, but there are some small tube amps as well. They feature low power (10-30 watts) and small (8" or 10") of speakers. While lower power (10-15 watts) are only good to use in your room for practice, 30 watt is often enough to play together with a drummer, still being heard. Usually about 50 watts and 12" speakers for fuller sound. Good for rehearsal and playing smaller venues. These amps are like the 1×12's but come with another 1×12 speaker for louder, richer sound. Good for playing before an audience, while still staying usable in your living room. Lot of guitarists prefer these over 1×12 amps, as 2×12's are still portable, while providing you the needed power and presence during a gig. Real powerhouses which made of a head, which is the amplifier by itself (without no speaker), and one or more amplifiers plugged to. 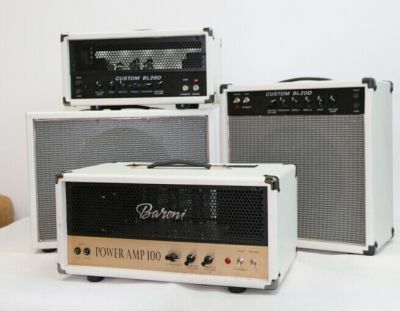 Guitar amp heads usually come with at least 50-100 watts of power, and 200-400 watts are commonly used as well. But these, however are too loud to use anywhere else than a big audience. Built-in Effects: An important factor if you wish to play certain styles. Good effect includes Chorus, Digital Reverb, Delay to name a few, which are used commonly. Tremolo is another effect many amps feature, along with Flanger or Phaser. Modeling amps usually contain multiple built-in digital effects. Aux in, Foot SW, etc: Another factor to consider: Can you plug your mp3 player to the amp? Can you use headphones with it? Can you plug in an effect pedal, microphone or another guitar maybe? Your amp do not necessarily have to have all these features, it always depends on what you would like to use. Usually with modern amps you can plug in effect pedals, there is Aux, for plugging your mp3, and it is not uncommon to be able to plug in, and use it with a headset (good for the night sessions in the bedroom). Channels: Always important. Does the amp have multiple channels? Most of the amps come with clear channel for clear, more acoustic-like sound, while also include distortion channel. Which founded in the 1990s in Italy, It is now a key manufacturer of innovative vintage guitar effects pedals and amplifiers. privides a smaller number of highly developed and refined boutique products, which far better than hundreds of mediocre copied products.